Updated 3/11/2019. Please see the post about Emma; she would love a letter from your dog. Thanks. Updated 12/28/2018. Click on ‘Dogs’ in the menu, then click ‘Dog Diapers’. Hello there!! My day so far included learning how to create a blog. If you are reading this…good for you!! If you enjoyed reading any part of my blog, good for me!!! The only way I’ll know that you visited is if you leave a comment. So, stop in, read, enjoy, comment. Thanks!! First I needed to find an available domain name. Hmmm, my online name is mary greene but someone already has that one. Played around and tried several times until I finally found an available name. What I ended up with is the real m greene. Okay, that doesn’t sound too bad. But wait. All pushed together it reads therealmgreene. Which, looking at it again it seems to say the realm greene. Great, I try to start a blog and end up creating an entire realm! Guess that’ll be okay since one definition of ‘realm’ is ‘a field or domain of activity or interest’. Maybe this blog will have activity and hopefully, it will be interesting to a few people. What will the blog be about? I’ll figure that out later. It’s been a really long day so far. Oh, and for the sake of honesty, this single day in my life actually took about three weeks. Hey, did you think creating an entire realm happens overnight?! 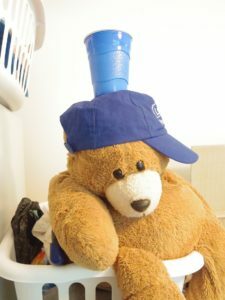 Let’s see if I can add a photo of a stuffed bear wearing a silly hat. If you have time to go back to the top and look at the menu bar. I added a few items that hopefully will be of interest. There is a drop-down menu. I did accidentally erased the entire menu, sigh, and had to put it back so now I can honestly say that it is new and improved. If you like any of my posts, please leave a comment. My big plan is to wait until I have at least 10 followers, then offer a small giveaway. Then do it again when I hit 20 followers. Oh, and if you find typographical errors, go ahead and let me know. Thanks.